When seeking cosmetic dental treatments to improve your smile, consider veneers, as they can make a significant impact on your smile. Smiles by Design offers high-quality veneers at our Grand Rapids location to provide beautiful new smiles for our patients. For a consultation to discuss your options for dental veneers, call Dr. David Boone today. Traditional veneers are thin pieces of fine porcelain that are attached to the front of teeth, addressing certain flaws and completely transforming your smile. Dr. Boone provides dental veneers for his Grand Rapids patients because of the dramatic effect they can provide. Our patients who have had veneers placed consistently express an increased level of confidence and a new freedom to share their smile. What is Involved in the Veneers Process? The initial consultation includes an assessment of your oral health including an exam and necessary x-rays. Dr. Boone also discusses the causes of your cosmetic concerns to determine if bite issues or teeth grinding are to blame. He will ask about your dental habits such as ice chewing or other behaviors that have affected your teeth and may threaten your new veneers. 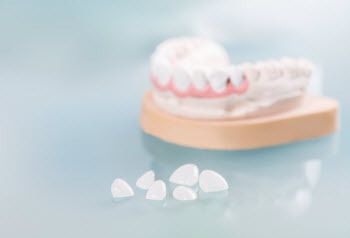 Depending on the cause of wear, Dr. Boone recommends the appropriate treatment for your cosmetic restorations. Once you have decided on veneers to address your concerns, we will obtain a precise impression of your teeth for your custom veneers to be crafted by our lab. When you return, in about two weeks, Dr. Boone prepares the teeth to be treated by removing some of the enamel, if necessary. This ensures a tight and proper seal when he carefully applies your veneers. With veneers from our Grand Rapids dental office, you can have a new, beautiful, and natural-looking new smile in approximately 15 days. Our dentist is dedicated to listening to your dental concerns and helping you find the right solution to meet your individual needs. Our entire team is here to make your time at our dental practice positive and rewarding. Dr. Boone finds great satisfaction in seeing his patients happy and able to express their joy with confidence. If you want a smile you can be proud to show off, call Smiles by Design today!